Review The Project Manager Role for an overview of PM responsibilities at CivicActions. New PMs should shadow other PMs calls, meetings, scrums, retrospectives, sprint demos, kick-offs, etc. New PMs to know how to react if someone calls on them unexpectedly, and how to quickly move along the meeting and get it back on track. The new PM should have a quick checkin like "No project checkin. Here observing. Balance 8. I'll pass to Steve"
New PM can practice taking meeting notes so they can compare their own notes from a meeting to the notes the PM actually shares with the team & client. New PMs can also take notes while current PM is still running meetings. PMs to shadow other PMs calls, meetings, scrums, retrospectives, sprint demos, kick-offs, etc. New PM can practice taking meeting notes so they can compare their own notes from a meeting to the notes the PM actually shares with the team & client. For non-billable internal meetings, PMs should bill as CA > Delivery > Project Management. We use Harvest Forecast for documenting which projects team members are on, as well as their availability. For a team member whose time is split between projects, Forecast helps plan how much time should be allocated to each project. The PM is generally the person to schedule all scrum ceremonies, client meetings, process meetings, and general team meetings. The team is also always welcomed to schedule one-off meetings for the internal team if they desire. Make a relevant and detailed meeting title. Make it descriptive and concise. Only require the necessary people, make other invitees optional. Check the FIND TIME function in Google Calendar to make sure you're not double-booking someone - it is crucial that you look at other people's calendars. Consider turning on your clock's seconds so you can keep close eye on your timeboxes - You'll know if you have one minute or 5 seconds left. It helps! 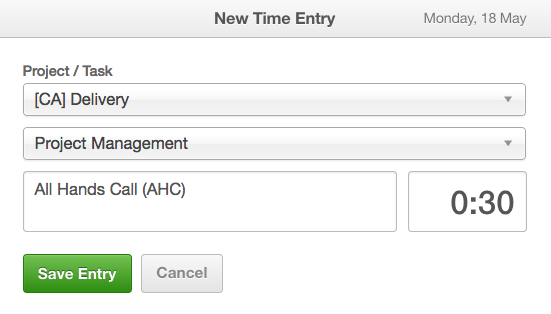 A role of the PM/ScrumMaster is to keep track of timeboxes by keeping communication on topic and moving efficiently. Divvy time up if you have multiple presenters and let each person know how much time they each have. Acknowledge when the timebox has expired and make sure folks can stay longer if needed. Accurately estimating is one of the most difficult things to do. Developers should ask questions if necessary to gather information about a story and the anticipated tasks related prior to estimating. Once a proposed strategy for implementing a ticket is complete, estimating can begin. As many developers as possible will ideally estimate together and agree upon an estimate as a group. Planning poker may be used to prevent estimates from some developers from affecting the estimates of others. Sometimes an average of the estimates is taken. Other times a conversation might ensue justifying a higher or lower estimate.